Welcome to my Tag Team & Review. We share our reviews and giveaways, giving you two views and two chances to win! Today we are happy to share Scraps of Paper by one of our favorite authors, Kathryn Meyer Griffith. There are 5 books in the series and our her best sellers. The ebook for Scraps of Paper is free on many websites. It is also available in Audio on Amazon and you can find it on Goodreads here. 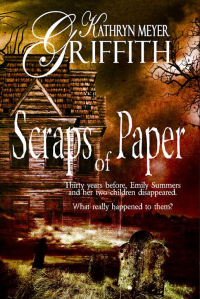 I love the cover for Scraps of Paper by Kathryn Meyer Griffith…and that tagline…how could I possibly resist? I feel a sense of foreboding. The book is free everywhere, so feel free to grab a copy. After two stagnant years of her life, Abigail has found out that her husband, Joel, had been murdered. Misery put her on the road in search of a new life. She was determined to become a new person. To find time to live and love. Spookie Town called to her. The past and the present merge and the mystery grows. I love the direction she goes to solve the mystery of Emily and her kids disappearances. She moves into the an empty house and begins to find Scraps of Paper. 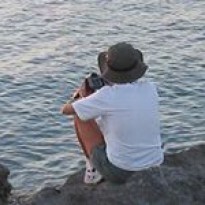 To find the answers to the mystery makes me think of a scavenger hunt. Kathryn Meyer Griffith has a way with words and once I begin one of her books, it is hard to put it down. So true with Scraps of Paper. I felt Abigail’s pain and her need to find a way to go on after her husband’s death. When she moves into the empty house, the former tenants mystery becomes hers. She feels a need to find out happened to them because we all need answers…don’t we? I voluntarily reviewed a free copy of Scraps of Paper by Kathryn Meyer Griffith.